There are times when you can look back, and recognize the folly of your relative youth. Times when you didn’t realize the fleetingness of existence and proceeded with your life, careless that the world around you may forever change. In particular, pertinent to this day and this post, I keep kicking myself for passing up a chance to see Douglas Adams when he came to speak at my university. That was April 25, 2001. He died May 11, 2001 of a heart attack. I had thought to myself, that surely, I would have a chance to hear this great man again, and that missing this one university event wouldn’t matter too much to me. So. 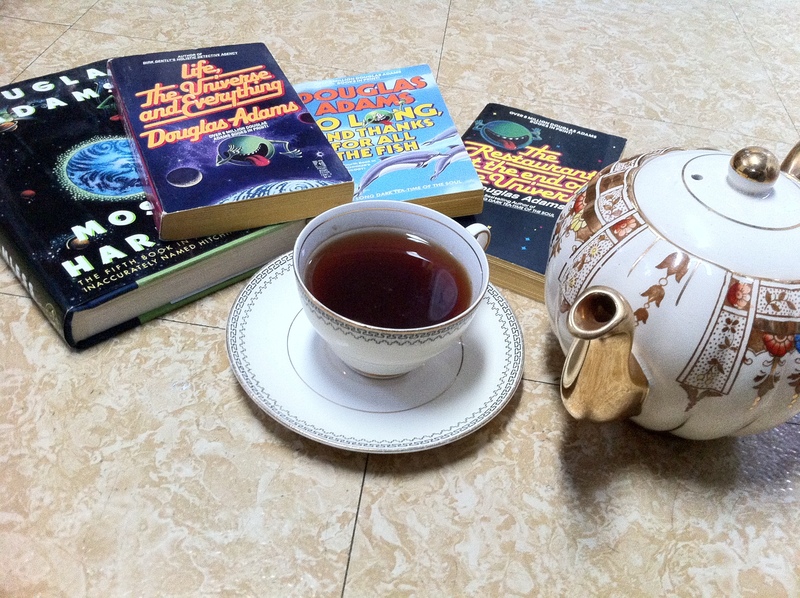 To honor the anniversary of the birth of Douglas Adams, our first science experiment regards, in part, the thermal properties of a cup of tea. Having used an electric kettle many times while overseas, and having recently acquired one, I was under the impression that water boiled in said kettle, cooled off more quickly than expected. This led me to question how the cooling rates of water boiled & kept in an electric kettle compared to those of other vessels. 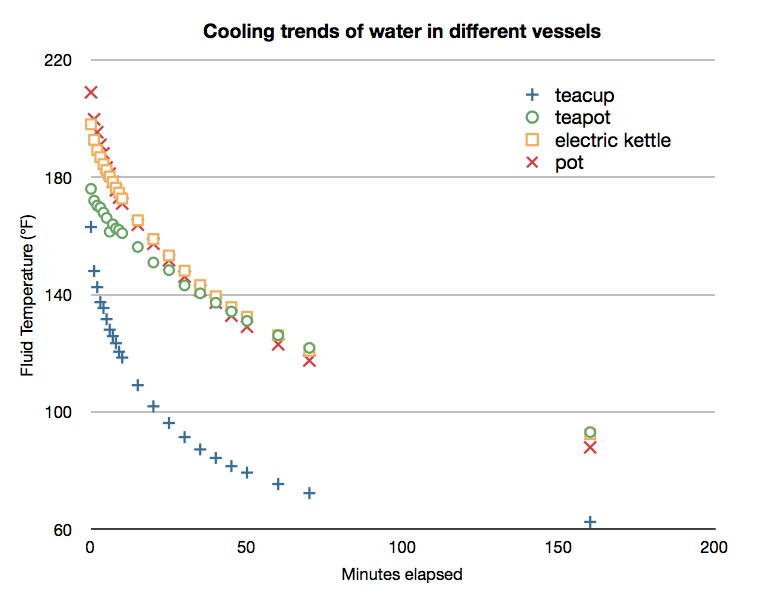 After boiling, how does the water temperature vary over time between an electric kettle, stainless steel pot, and ceramic tea pot (and for fun, in a china tea cup)? I expected that the electric kettle would boil faster than water on the stove, and that the thermal properties of the electric kettle would allow the water to cool more quickly than water heated in a pan on the stove. The tea pot and tea cup were added in light of the significance of today’s date. The tea cup is obviously expected to cool the most quickly of the four, as this would hold the smallest volume, and would lack a cover. Fill the electric kettle and medium pots with 1 liter of water in each (I used the 1-liter mark on the electric kettle to measure into each large vessel) . Place 6 ounces (volume) of water in the small pot, this will go into the tea cup. Place the electric kettle on its base (or plug in) and turn it on. Similarly, place the pots on different burners on the stove, and turn the burners on. Start a timer, and note when each vessel attains a boil. Use the instant read thermometer to measure the temperature of the water in each vessel. Warm the ceramic tea pot by swirling a small amount of water from the second medium pan inside of it, then pour in the rest and emplace the pot’s lid (this is apparently more necessary with thin or delicate china in order to avoid thermally shocking it). Life is easier if the electric tea kettle, tea pot, tea cup, and pot, are all somewhat near each other. Measure temperature of water in each vessel using the instant read thermometer. Note: due to density differences of water caused by temperature, try to be consistent about where in each water body you record temperature from. The coolest readings should be at the bottom of each vessel, and the warmest near the top of the water. My readings were made from the middle of the water body in each vessel. Take temperature readings once per minute for 10 minutes, then once every five minutes for 30-40 minutes, and once every 10 minutes thereafter. Stop taking measurements when you get bored with it; the cooling rate should be quite stable after an hour. Drink your tea, while you ponder life, the universe and everything . Surprisingly, the electric kettle boiled 1 liter of water in exactly the same time as it took on the stove (~ 6 minutes). Additionally, the electric kettle, while it did not seem to get the water to quite the same temperature as the water boiled on the stove (208°F vs 211°F), it retained heat better than the metal pot. The ceramic tea pot absorbed a lot of heat at the beginning, making the first temperature reading quite low compared to the other 1 liter volumes. However, in terms of heat retention, the tea pot was the winner. After an hour of recording, its water was the warmest. I imagine that a more thorough pre-warming of the tea pot would have heightened this difference. The large gap in measurements between 70 minutes and 160 minutes was caused by the urgent desire to go drink a pint of beer at the local brewery. Those late data points fit very well with the cooling trend measured over the first 70 minutes, so it is highly unlikely that anything interesting was missed by not recording during that time. By 160 minutes the cup of tea (62.5° F) had pretty much reached the local room temperature (61° F). Is the electric kettle more efficient than the stove at heating 1 liter of water, in terms of watt-min/° rise? What happens if the ceramic tea pot is throughly warmed before accepting the water that will be measured? 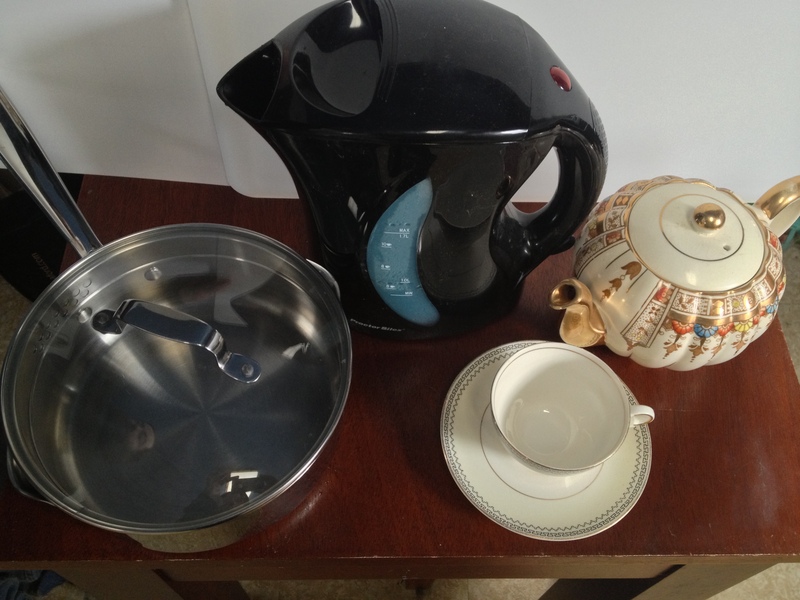 How does a proper tea kettle compare against the vessels tested?